Vietnam has seen a boom in renewable energy projects, in a bid to meet the nation’s future demands for power, after the Government scrapped plans to build a nuclear power plant in Ninh Thuan Province. Experts have noted that this is a golden opportunity for the country, which is confronted by environmental issues, to develop renewable energy, given the huge potential of wind and solar power. In 2015, the Prime Minister approved a renewable energy development strategy by 2030 with a vision to 2050, which targeted an increase in the ratio of power generated from renewable energy to 32 per cent by 2030 and 43 per cent by 2050. The national project for power development in 2011-20 also identified developing renewable energy as a breakthrough to ensure the security of the nation’s energy supplies, and reduce the negative impact of generating power on the environment. This could be regarded as a launching pad to promote investment in developing renewable energy in Vietnam, according to Vo Tan Thanh, deputy chairman of the Vietnam Chamber of Commerce and Industry. There were some 50 wind power, and more than 100 solar power projects, along with a number of biomass projects being developed in the country. Hundreds of solar projects have been registered, as of July 2017, allowing them to seek investors, with a total capacity of up to 17,000 MW, according to an estimate by the Energy Programme’s officer under the US Agency for International Development. Also, many investors recently announced very large investments in renewable energy projects in Vietnam. Thiên Tan Group announced it would invest US$2 billion in building five solar power projects in Ninh Thuan Province by 2020. The group also seeks to develop some 20 large-scale solar power plants in the northern provinces by 2020. In late January, BIM Group began construction of the BIM 1 solar power project in Ninh Thuan Province, with a planned annual electricity output of 50 million kWh, in cooperation with AC Energy, a subsidiary of Philippines’ Ayala Group. The group planned to develop the largest clean energy farm in Vietnam in Ninh Thuận Province, with a total capacity of 300 MW, by the first quarter of 2019, with a target of producing 1,000 MW of clean energy by 2025. Besides Ninh Thuan, investors were also keen on developing solar power projects in other provinces, with a potential for generating solar power in Phu Yen, Binh Phuoc and Khanh Hoa. Recently, Asia infornet INC, a member of Japan’s AIN Group, began working with Binh Phuoc Province on the feasibility of developing a solar power project in Becamex Industrial – Urban Zone. The Phu Yen People’s Committee said that it allowed 17 investors to carry out field surveys and study the possible development of solar power projects, with a total capacity of 1,310 MW, in the province. 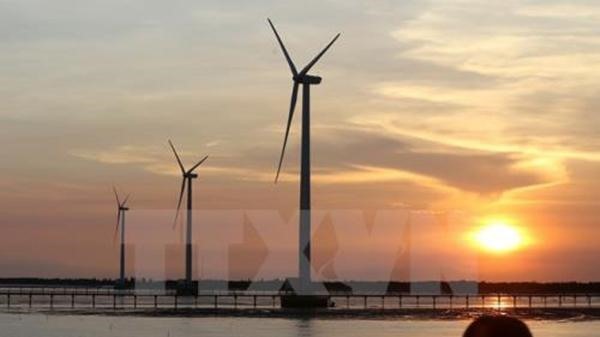 Besides solar power, wind energy projects are also being developed, such as a 98 MW wind power plant by Super Wind Energy Cong Ly Soc Trang in Soc Trang Province, the 373 million kWh Bac Lieu wind power plant phase three, and phase two of the Dam Nai wind power project in Ninh Thuan Province.